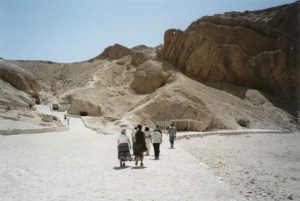 Beyond the semicircle of rocks of Deir el Bahari lies the Valley of the Kings or Biban el-Muluk, which means the Gates of the Kings. This famous gorge, dominated by a peaked mountain called ” Theban crown”, contains the necropolis of the great Egyptian sovereigns from the sudden, unexpected decision of Thotmosis I to separate his tomb from the burial temple; moreover, he gave orders to bury his body not in a luxurious monument but in a secret, inaccessible place. His decision rudely interrupted a 1700-year-old tradition! His chief architect, Ineni, dug a well-tomb in a solitary valley, cutting a steep flight of steps into the rock leading to the tomb, along with certain lines which were then followed by subsequent Pharaohs. It was Ineni himself who wanted to document the secrecy of his undertaking, ordering the engraving on the burial chapel wall of the phrase ” I alone watched over the construction of His Majesty’s rock-tomb. Noone saw or heard anything”. The latter phrase, however, is hard to believe: it is much more likely that the workers who built it were war prisoners who were the eliminated upon termination of the work. But, as in the case of the other sovereigns, Thotmosis I was destined to reign for a very short time because already in the Pharaoh age, despite the safeguarding of teams of guardians night and day, robbers systematically broke into the tomb to remove the valuable objects: one of the most sought after articles was the “scarab beetle of the heart”, the amulet which placed on the heart of the mummy, enabled the dead man to save himself from the day of judgement. But these powerful sovereigns were destined not even to find peace upon their death. In fact, it so happened that at the time of the weak reign of the Ramses, the priests of Amon had lost all their power and authority. As a sign of their devotion, to ensure their dead sovereigns a quiet life in the next world and to avoid profanation, they started transporting the royal mummies from one burial place to another and these transfers were so frequent that Ramses III was buried thrice! Finally, they decided to secretly prepare a virtually inaccessible hiding-place: on Mount Deir el-Bahari they dug an approximately twelve-metre deep well connected by a long corridor to a large room. At night by torchlight, as furtive as tomb-robbers, the priests removed the Pharaohs from their corpses in a cave in the mountains, hanging a shield around their necks bearing their names for identification purposes. They had been dead for a few years or numerous centuries and had had short or long-lived reigns; some of them had been the most powerful sovereigns in the entire world. And now here they all were alongside each other helter-skelter: Ahmoses, the founder of the XVIII Dynasty next to the conqueror Thotmosis III; the great Ramses II alongside his father Seti I. Altogether, there were forty Pharaohs bodies hidden in this anonymous sepulchre in the heart of the mountain for three thousand years. It was a young tomb-robber by the name of Ahmed Abd el Rasul from the village of Gurnah who came across that hiding-place in 1875; for six years he and his brothers managed to keep the secret, enriching themselves by trading the objects that they gradually brought to light and on the 5th July 1881, after a long interrogation, the young Arab led the vice director of Cairo Museum at the time, Emil Brugsch – brother of the famous Egyptologist Heinrich – to the entrance to the well. It is hard to imagine how the scholar felt when the uncertain light of a torch revealed the mortal remains of forty sovereigns of the ancient world! A few days later, the mummies were packed and transported to the valley, where a ship was to take them to Cairo. And then a strange, stirring event occurred: on hearing that the refound Pharaohs were leaving their century-old burial place, the peasants of the valley with their wives assembled on the banks of the Nile and, with the slow passing of the ship, paid homage to their ancient kings, the men shooting into mid-air and the women wailing and sprinkling their faces and chests with dust. Nowadays access is gained to the valley by means of a comfortable carriage road that largely follows the old tracks of the funeral procession. the tombs have kept their ancient charm inact: the countless graffiti on the walls show that since Greek and Roman times they were the destination of visitors and pilgrims who left a souvenir of their visit in this way. One of them, the English Dean Stanley, left an account of his journeys in 1856, affirming that ” he had seen the tombs of the kings and the entire religion of Egypt revealed as it appeared to the most powerful Egyptian rulers in the most salient moments of their lives.